Normally I wouldn't go actively seeking card games for my PC but I guess there's a certain appeal to them. They're simple to learn and are the sort of games you can play while waiting for other things to occur in the background. I received this as a present from fellow reviewer, Choona (thanks!) so while waiting for several gigs of Starcraft II to download, I played a few rounds of Texas Hold 'Em! The main highlight of Poker Night at the Inventory, or at least what distinguishes it from its competition, is the fact it has gaming character "celebrities" playing against you. As far as gaming character celebrities go, these guys are probably B-grade since they're not exactly Mario, Sonic or Gordon Freeman but I've heard of them before and was familiar with three of them in terms of their personality. "As far as gaming character celebrities go, these guys are probably B-grade since they're not exactly Mario, Sonic or Gordon Freeman"
The four characters you get to play poker with are the psychotic rabbit Max (from the adventure game series, Sam and Max), Strong Bad (from the website, Homestar Runner), Heavy Weapons Guy (from Valve's class-based FPS, Team Fortress 2) and Tycho (from webcomic Penny Arcade). While at first glance, you wouldn't think any of these characters would have much to talk about, they are in fact capable of quite amusing banter. There are lots of in-jokes for fans of the characters and their personalities come out perfectly when playing. Max is suitably unpredictable and flippant, Strong Bad is his typical cool self (or at least he thinks so), Heavy Weapons Guy is a simple man who enjoys calling the other opponents "babies" and Tycho is snide and sarcastic. I'm not going to go into the rules of Texas Hold 'Em Poker, but that's what this game is all about. Your enjoyment in this game will be dependent on whether you like playing poker with virtual money (and also whether you like any of the characters). The Poker component of the game is implemented well and while it has its moments I'm principally drawn to the characters of the game more than anything else. Voice acting is fantastic and they managed to grab all the original voice actors for the characters. The music is subdued and not very noticeable, however what is played is good. Nothing memorable but good. Recreations of the characters are generally well done, but that wouldn't have been too difficult with two out of the four characters as they already appear in Telltale games (Max and Strong Bad). Tycho looks interesting as a cel-shaded comic-book character and the Heavy Weapons Guy surprisingly looks just as he does in Team Fortress 2. However there are some minor shading issues which means the graphics score suffers as a result. Replay is dependent on whether you like replaying games of poker ad nauseam. There are achievements you can earn which helps and you can even win items to be used in TF2, however, after playing for some time you'll start to memorise all the conversations the characters have with each other which gets a bit old and potentially annoying. Very few bugs in this game, but you wouldn't expect any for a simple Poker game. The only bug I did notice is that occasionally the same line is read by character twice in a row, which is slightly annoying and not terribly realistic. 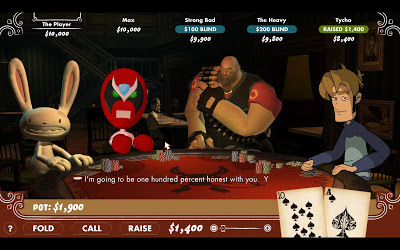 If you happen to like the characters (Max, Strong Bad, Heavy Weapons Guy and Tycho) and enjoy playing poker, Poker Night at the Inventory is an amusing distraction from the "serious" games in your library. The game is quite cheap too so it won't blow your bank balance. The only downfall of this game is that after awhile, you'll have heard the banter between the characters a thousand times before.